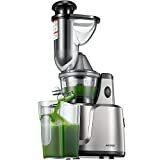 i Click 'view all' to instantly compare this fantastic deal with offers on other top cold press masticating juicers. 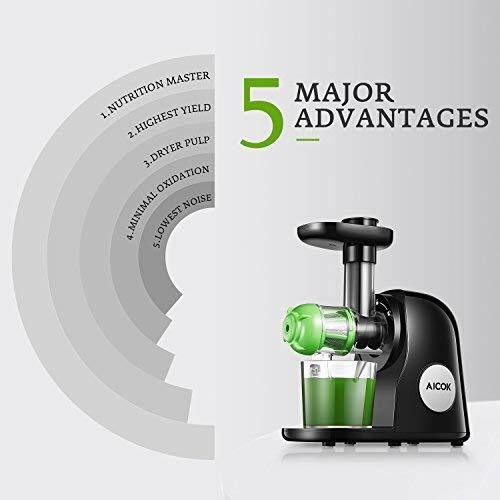 Aicok Slow Masticating Juicer Juice Extractor Easy to Clean & Reverse is currently selling at $149.99, approximately $10.80 lower than average, giving a potential saving of $28.44 right now. With a lowest price of $149.50 and an average of $160.79 it is selling on the low end of its usual range. Price volatility is 4.01% (meaning it changes a few times a week), so the price may rise in the near future. Right now this product is a recommended 'fantastic deal'. 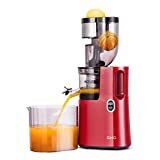 Compare the current price, savings (in dollars & percent) and Buy Ratings for the top Cold Press Masticating Juicers that are closely related to Aicok Slow Masticating Juicer Juice Extractor Easy to Clean & Reverse. Here is how Aicok Slow Masticating Juicer Juice Extractor Easy to Clean & Reverse compares with other leading Cold Press Masticating Juicers. Aicok Juicer Queen is the best choice on the masticating juicer market. Lead your life better! 1. Upgraded spiral system Compared to other juicers, it has an upgraded spiral system for better nutrient extraction. Extract maximum juice yield, minimal oxidation. 2. Quiet motor Quiet juice extraction process, even if used in the morning or at night, will not wake up the sleeping person. 3. Baby health Fruit juice and pulp are perfectly separated, solve the problem that children don't like fruit. Let the children drink nutritious juice. 4. Prevent clogging Reverse function can quickly and effectively solve the jam of juice. Easy to clean and use. ?Please note ? To protect the motor, the juicer will start working after 3 seconds when you press " Start " to hear the BI sound. ? It isn't recommended to use the juicer for more than 20 minutes, which will affect the motor use next time. ? Do not put any hard material, large seeds, ice or frozen products into the feed hole of the juice extractor. Specification Color: Black Wattage: 150 W Voltage: 110 V Speed: 80 rpm Product caliber: 45mm / 1.77inch DC motor UL, ETL Certified. FeaturesUPGRADE THE SPIRAL SYSTEM - 7 segment spiral opening up each cell for maximum juice yield, minimal oxidation, most nutrition.80 RPM SLOW MASTICATING AND GRINDING - 90% More Nutrition Growth. Without creating too much heat and friction, reserves the vitamins, enzymes, minerals, trace minerals and nutrients. Less foaming and no clogging.JUICE & PULP SEPARATION FUNCTION - Perfectly separates the pomace from the juice, and extracts the nutrients from the fruits and vegetables into juice. Enjoy the pleasure of less pulp.BABY HEALTH AND SILENT - Runs less than 60 decibels. Safe PMMA material, easy to assemble, operate, and clean, dishwasher-safe parts make cleanup a breeze. A heavy-duty and stable body that let you enjoy a quiet life.